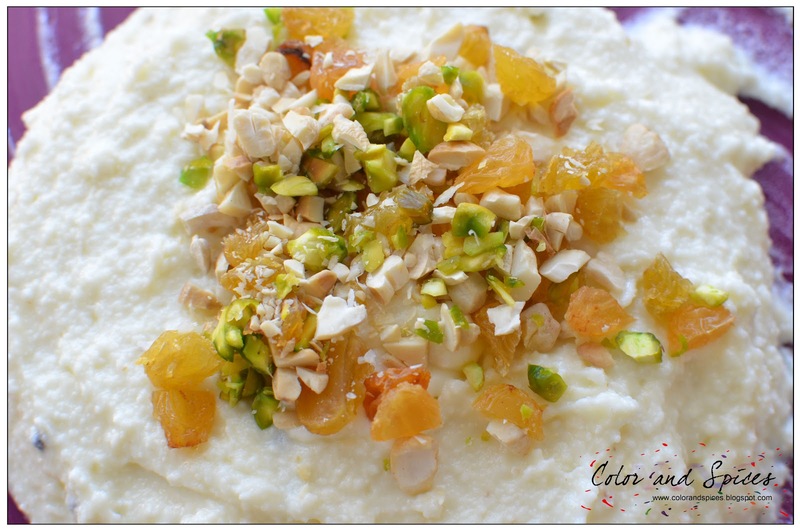 Chena poda(baked cottage cheese) is a sweet dish from the state of Orissa, India. The literal meaning of Chena poda is burnt cheese; Chena is cottage cheese and Poda means burnt. 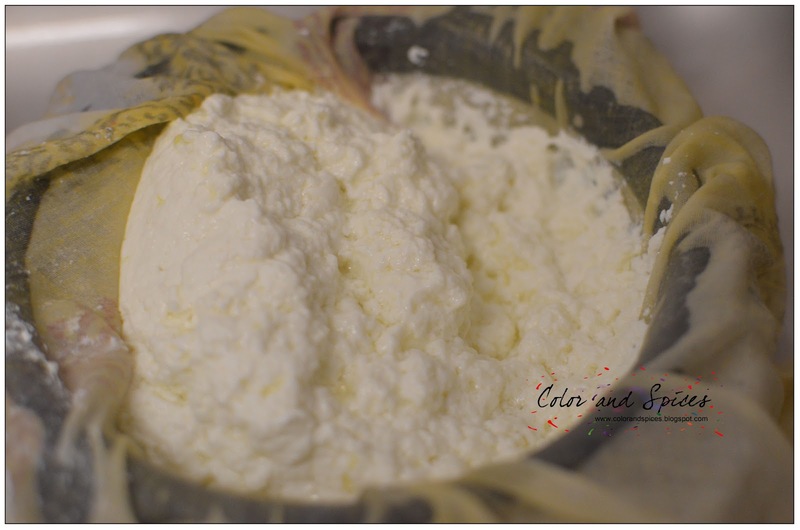 The procedure is simple, home-made cottage cheese is well-kneaded along with dry fruits and sugar, then it is slowly baked till the caramelized brown color appears. What makes this sweet dish different from other Indian desserts is the flavor of caramelised sugar. 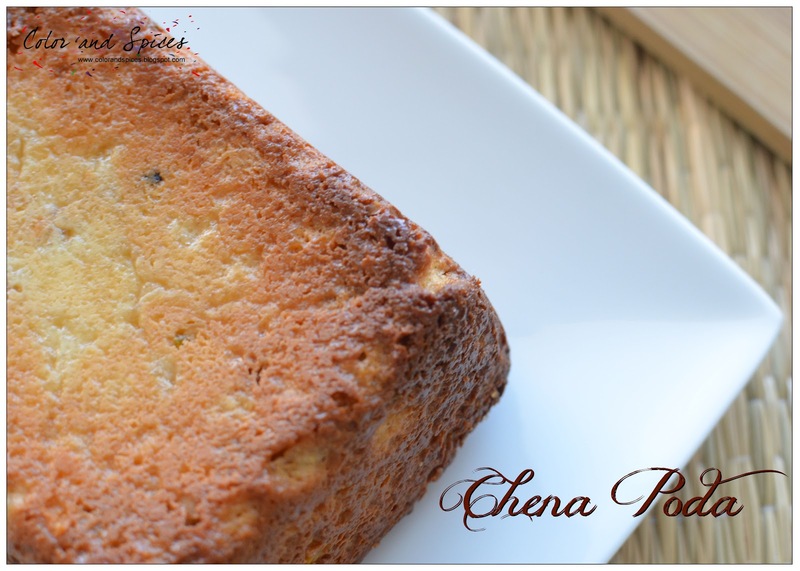 Chena poda is usually made at home during traditional festivals and as offerings to the God. It is said that Chena Poda is Lord Jagganath's favourite dessert. It is also sold in small roadside stalls and confectioneries throughout the state of Orissa along with other delicacies. Even it has found its place in the restaurant menus across Orissa. According to sources the best chena poda can be found in Nimapara in Puri district of Orissa. I must thank my friend Smriti for reminding me of this traditional sweet dish and of course I must mention Rumela, whose delicious chena poda pic forced me to bake one for myself. As I discussed earlier chena Poda is nothing but baked home made cheese, so first we should learn how to make chena or chana(home made cottage cheese). 1.Boil the milk in a heavy bottom pan in medium heat. Stir in between to prevent from sticking it to the bottom. 2. 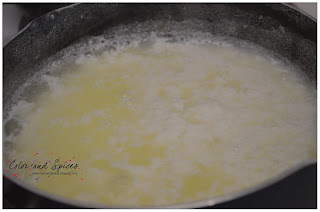 As the milk boils, gradually add the lime juice and stir. You will notice that the milk gets curdled into white solids and a greenish whey gets separated. Turn off the heat. 3. Now strain the curdled milk through a sieve lined with cheese cloth or a piece of muslin cloth. 4.Press the chena to take out the whey. Now the chena would be very hot. Run cold water through the chena. It helps to remove the smell of lime juice from the chena as well as prevent the chena from getting hard. 5.Tie the chana in the muslin cloth and hang it for 15-20 min, so that the water drains out. 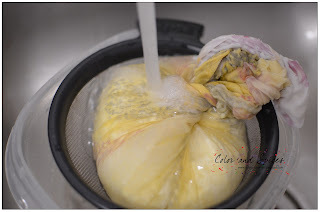 6.But make sure you do not drain it for too long and the chena does not get too dry. It should be moist enough to knead it smoothly. Now your chena/chana is now ready. Next come the steps for making chena poda. 1.Take the home made chena(after draining out the water) in a flat plate and knead with your palm till you found no lumps in the chena. 2. Add suji(semolina), sugar and powdered green cardamom to the kneaded chena. I used powdered sugar, as it is much easier to blend. Mix them well. As you will mix the sugar you will see the chena will become wet. 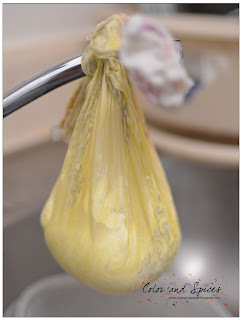 It will take a moist smooth soft texture. 3. Add the chopped dry fruits. Mix well. 4. Pre-heat the oven to 425F/218C. 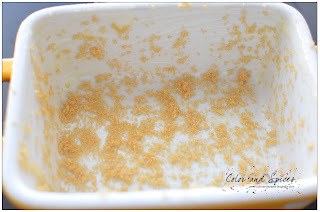 5.Take baking tray grease it with ghee and dust it with brown sugar. 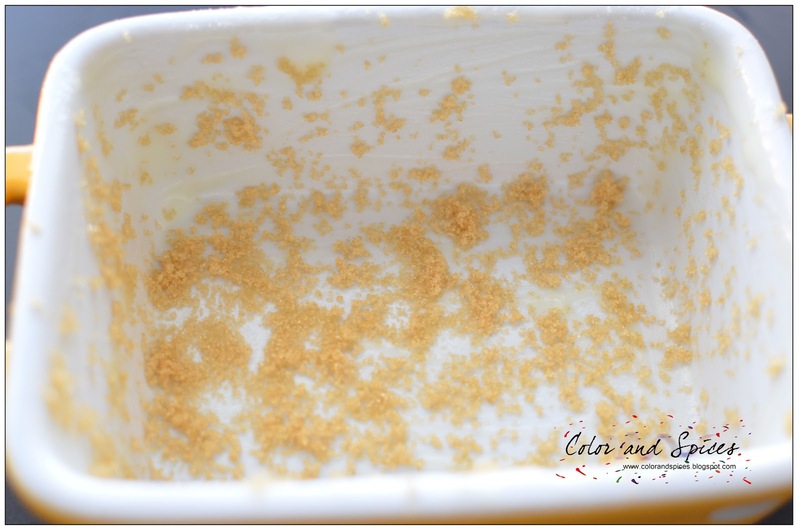 This brown sugar will caramelised to give a brilliant brown color to the chena poda. 6. Add baking powder to the chena just before putting it inside the oven. 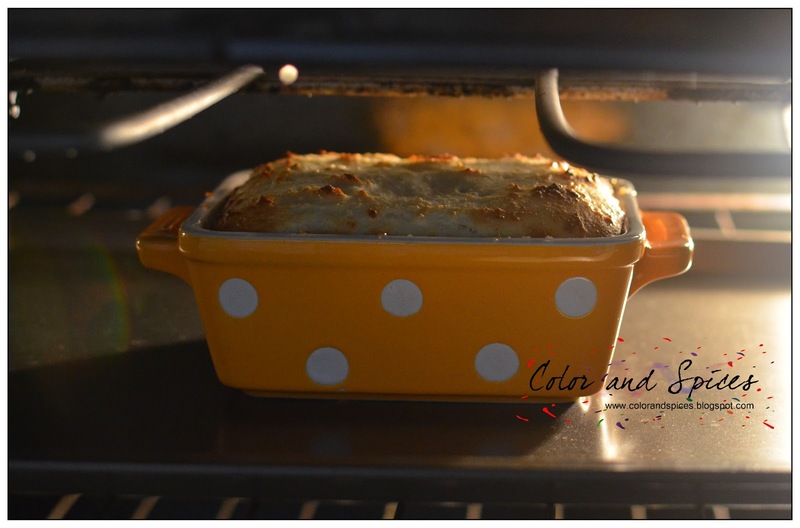 Mix baking powder well and put the mixture evenly in a baking tray or oven proof bowl. Flatten the surface with a knife or spatula. 7. Bake for 30min at 400F/200C. The chena will rise just like a cake. 8.Grease an aluminium foil with ghee(clarified butter) and cover the baking tray and keep baking at 200F/100C for 20min. But be very careful when you are doing this, the baking tray would be very hot, so take care and do not burn yourself(as I do that very often). 9. 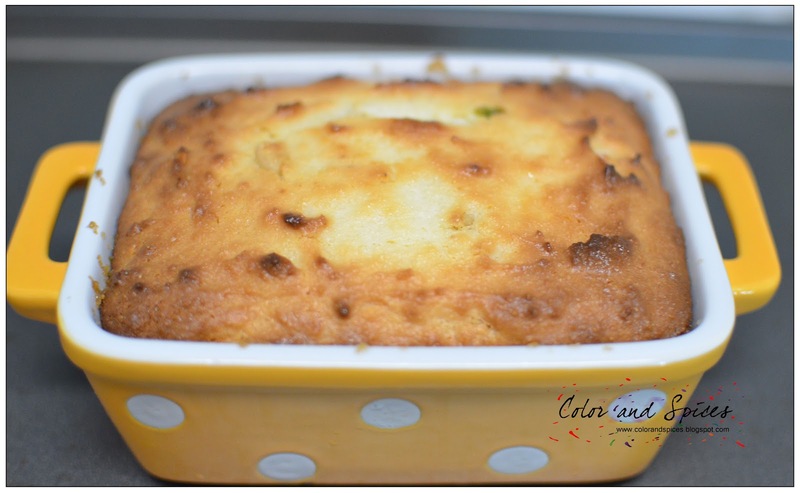 Insert a toothpick or a knife at the center of the baked chena, if it comes out clean then your chena poda is done. If you found sticky chena mixture on the toothpick or knife then bake it for some more time. 10. Let it cool down, take it out on a plate, cut into slices and serve. banate hobe.. achcha if i use normal sugar, will it work? In that case sugar ta age caramelise kore nile bhalo, jemon pudding ba caramel flan bananor somoy kore ni. caramelised suagr ta baking tray ba bowl e spread kore tarpor chana mixture ta dio. ami taratari hobe bole brown sugar add korechi. its awasome chitrangada! u r presentation and preparation is very impressive. It's brilliant job Chitra,Thanks to Malobika ami B'lore eshe Chhanapora kheyechhi ekta orrisa-confectionary theke,Amar r Borer dujoner i bhalo lage eta,even Malobika der o.Kintu tui amake eta bol,Convection Microwave e eta ki banano jai,amar kintu alada Oven nei. Tui jodi convection mode e cook koris that will be same as normal oven. Thanks for the recipe..well as an ORIYA I can say we LOVE CHENAPODA.. I tried this today, but I think the oven setting in Celsius should be 218( 425F), I tried the first batch keeping the oven at 300C, and it got burnt, literraly chhenapoda :-). Thanks a lot aindreem for pointing that out. I have edited that. Thanks for visiting my blog. I saw your lovely blog and just loved the dessert section. I am a big fan of bengali sweets. I found them all here. I am thrilled that I can try them in my kitchen. Chhenapoda looks so tempting. You have written such a beautiful write up about it. Will definitely try it out! 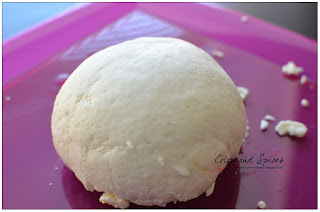 Channa r bodole Paneer use korle hobe? No, Saugat, it has to be freshly made chana, paneer hole hobe na. Tried it yesterday . Taste was good but it did not rise at all. Used exact measurements. Vani, not sure why did not the chena poda rise. Did you mix the baking powder just before putting the mixture in the oven? Did you check the expiry date of the baking powder, if it's not fresh then it will not work. Chitrangada please tell me chhena poda is available in Hyderabad? It's a traditional sweet from Orissa, I don't know if it's available in Hyderabad. 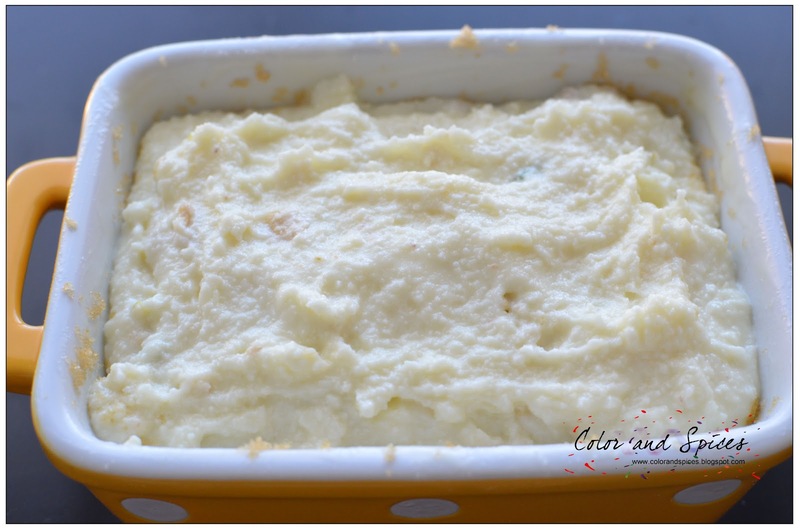 As it's not available so I have shared the recipe, make some at home. I am a Bangladeshi who is in awe of the variety of dishes on your blog :). 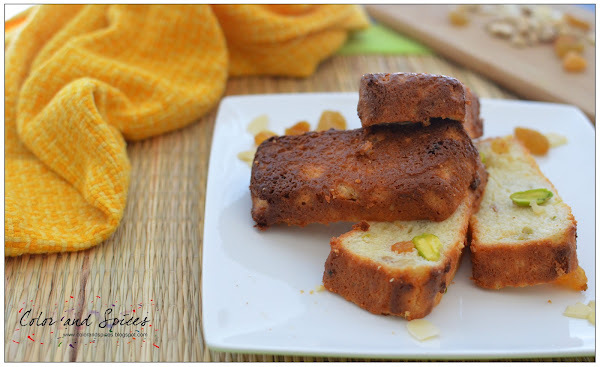 What is the texture of the chena poda? Does it dry out while baking or is it like a soft and moist cake? 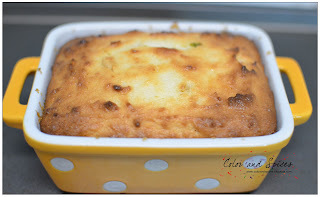 Chena poda will be moist and soft at the center while the outer part will have a caramelized thin crusty texture. know any place which serves good chena poda in kolkata ? Sorry I have no clue whether it's available in Kolkata or not. But it's so easy to make, try at home. 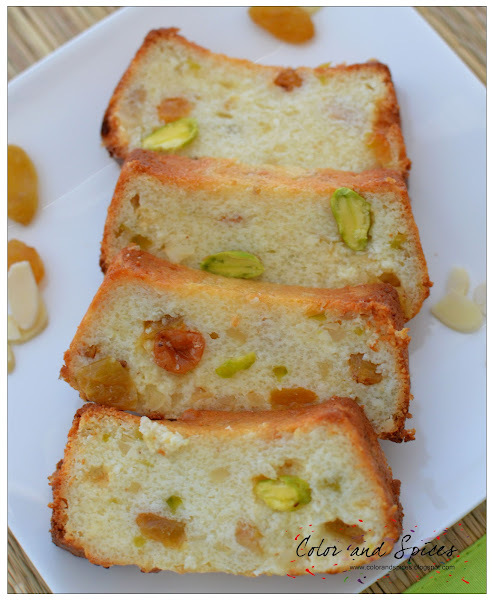 Nice recipe for Chena Poda (छेना पोडा). In tradition it is beked wrapping it in banana leaf and posted in wood fire . Recipe looks good. 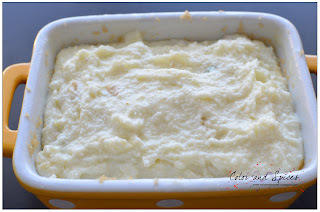 Is it fine or coarse semolina that you've used here?